Mario Kart 7 First Person Racing- Delightful, Or Disastrous? Find out if the new first person mode ruins or enhances the racing experience. 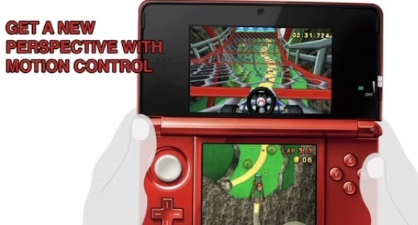 Mario Kart 7's first person mode is kind of a big deal, but Nintendo has yet to devote much time promoting it. To date, we've only seen one screenshot highlighting this new perspective (and yes, here it is below), while videos showcase brief snippets of footage. Strange, considering the feature works in tandem with the 3DS gyroscope and may change the racing habits of thousands, who'll argue that first person Mario Kart is the only way to play. That, of course, is up for healthy debate. Most fans will probably stick to the traditional third person view. On that note, we spent considerable time sailing through the air and throwing turtle shells in the first person, and you'll definitely want to experience it firsthand. 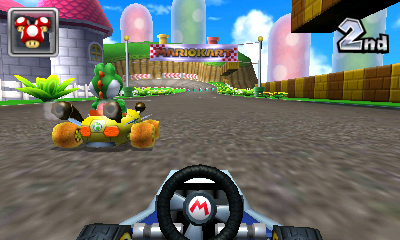 Unlike Star Fox 64's first person/gyroscope combo, the one in Mario Kart 7 is much easier to control, largely because the latter requires subtle movements to navigate through turns and avoid projectiles, while the former throws laser fire, asteroids and other bothersome obstructions onto the play field. The tilt is both tight and responsive. You'll have no trouble maneuvering underwater or grabbing power-ups. In fact, foregoing power-ups (activated with the left shoulder button) lets you enjoy the game with just your right hand; a bit tougher on harder difficulties. Thankfully, though, first person Mario Kart also works in tandem with the circle pad, if the gyroscope controls don't suit you. What's more, you can seamlessly transition from motion controls to the circle pad at will, instead of having to access an options menu. There's no break in the action. Even better, you immediately enter first person by pressing Up on the d-pad, then Down to disengage. As for the new view, it definitely makes playing Mario Kart more immersive. The game seems to move a bit faster, we found it easier to spot shortcuts and you see the track from a somewhat different perspective. On top of that, we loved ramming other characters off the tracks. It gives the illusion of driving a battering ram. In all, we think quite highly of playing in first person, and feel lots of gamers will stick with it the rest of the way. As for Nintendo, expect the publisher to make this a staple of future Mario Kart games moving forward.